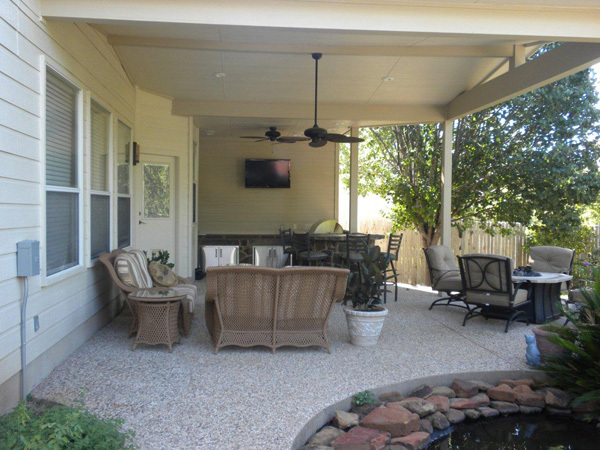 These Cedar Park, TX homeowners contacted us to construct a covered patio for their two-story home. The house is flat on the backside with lots of windows and their landscape architect had already completed some significant rounded rear patios that we were to incorporate into the design. The project was not without its challenges, but we were able to come up with the perfect complement to the existing home and structures. We initially experienced some issues with the covered patio because the home’s upper windows and large nearby tree were constricting to the allowable height of the area where the covered patio was to be placed. The homeowners wanted a closed wall where a TV could be mounted as well as a full option outdoor kitchen and a dining room area. We were at odds with the interaction of the room facilitated with the height limitations, the existing bay window over the kitchen and the roof pitch. We came up with a design that includes a lower and shallower roof pitch to compensate for the 2nd story windows and make the design cohesive. We also extended the area further on the right than the left, so the patio would still fit the guidelines of the rounded patio floors already constructed. We added structural supports in prime locations and used larger than normal beams to accommodate the extended span. To make the two roofs we built work together we used a cathedral ceiling on one side and a flat ceiling on the other. 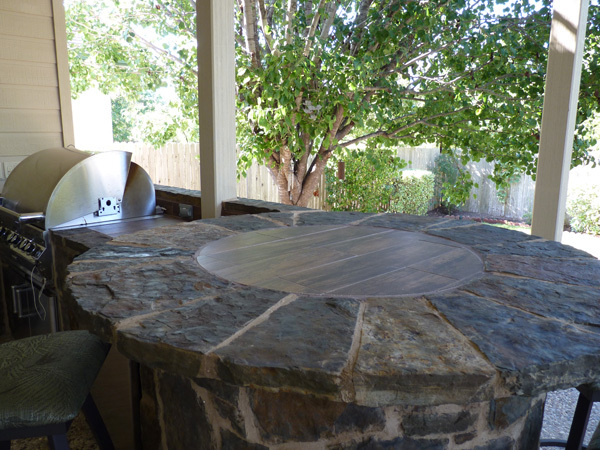 The unique round, flagstone bar top is a real show-stopper. The finished project includes a gorgeous stone bar which was designed to coordinate with the circular lines and add enough space so you can view the TV from any angle. The prime location of the bar area allows flow from the outdoor kitchen, and dining areas as well as access to the TV. In many cases it is difficult to decide where the bar stools should be placed in projects like this because you want a significant enough area to take in all the function and beauty of the entire structure and also allow for proper furniture placement and “pull-out” room as well. We used similar materials to finish the patio that were conducive to the integrity of the existing home. We used complimentary stone on the front of the kitchen and integrated unique stone and tile inserts into the counter tops. 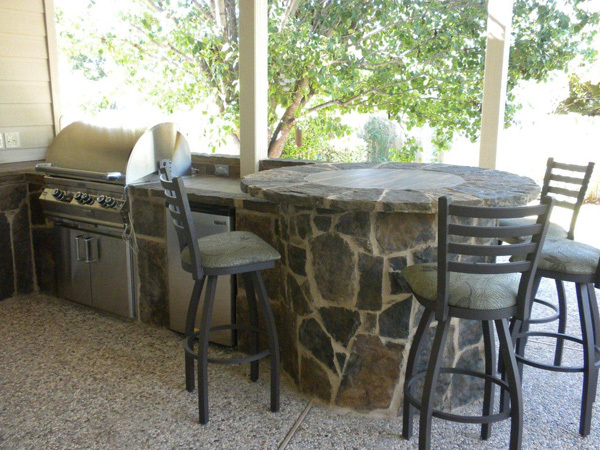 The outdoor kitchen includes a propane grill and side burner, refrigerator, storage and plenty of electrical outlets. 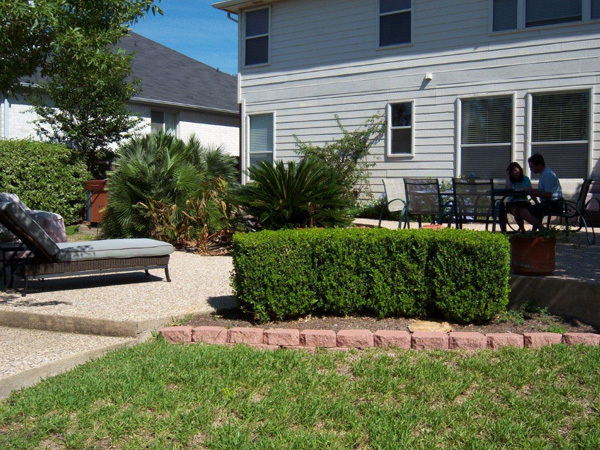 The finished project created an outdoor oasis that adds value to the home and the homeowners lifestyle. 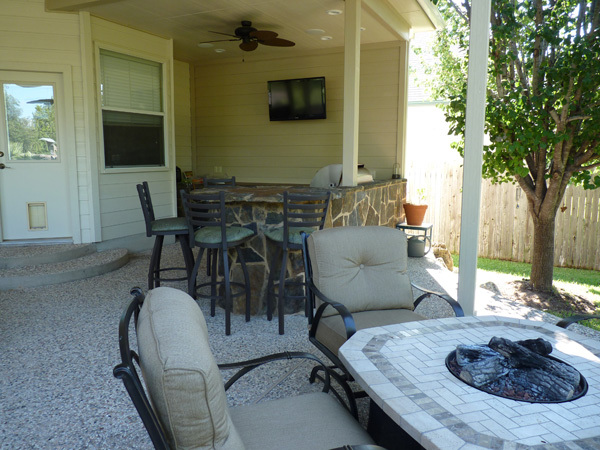 If you are thinking about creating an outdoor oasis in your backyard, contact Archadeck of Austin to make it happen. This is the season to enjoy the great outdoors and all it has to offer, family, friends, fun and your own little slice of paradise right outside your back door. This image details the stunning bar area on the outdoor kitchen, and beautiful stonework used in its construction. 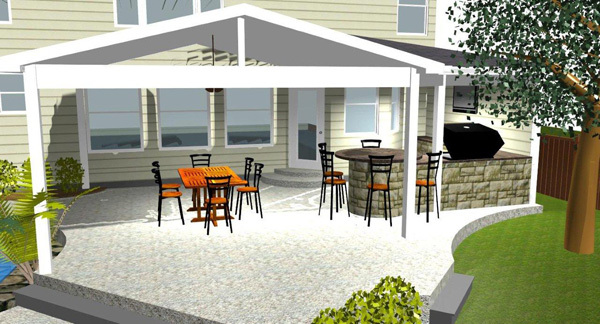 The finished covered patio includes a fire pit and many other accoutrements of outdoor living at it’s best. This entry was posted on May 9, 2012 by austinporchandpatio. It was filed under Austin outdoor kitchen, Covered Patios and was tagged with Archadeck of Austin, Archadeck of Austin design, Austin outdoor kitchen, Austin outdoor room, Austin patio builder, AustinTX flagstone outdoor bar, Cedar Park TX covered patios, Cedar Park TX custom covered patios, Cedar Park TX custom outdoor kitchens, Cedar Park TX flagstone outdoor bar, Cedar Park TX outdoor kitchens, CedarPark TX covered patio builder, Outdoor kitchens Austin TX.